Kim Waugh Racing Stables :: Weekend Racing Wrap! Lining up in the first race on the card a BM 88 over 1300m , Safado has drawn barrier 1 in a field of 10 with his regular rider Jason Collett aboard. With the recent wet weather hitting Sydney on Thursday night the track has been downgraded to a soft 7 so it will be very interesting to see what kind of surface we have come race time. 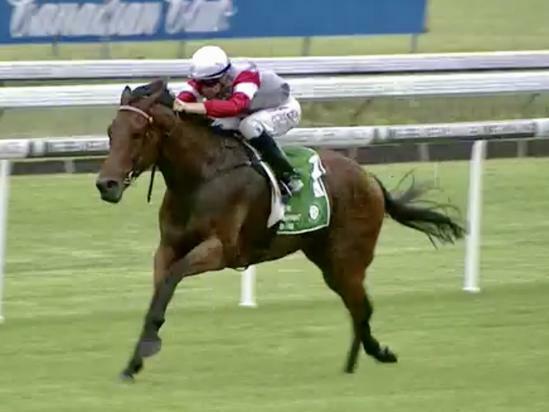 Goathland, another last-start winner for the stable competes in the G3 Sky High Stakes over 2000m. With his winning rider Blake Shinn in Melbourne, Jason Collett takes the reins in what looks a very open affair. Finally to the last race of the day and we certainly had no luck with the barrier draw with our runner White Boots drawing barrier 13 of 14 runners in the BM 70 over 1900m. Being an on-pace runner, if Boots can get the luck early he will as usual give plenty of cheek! At Gosford the stable has 2 runners, Mighty Marmalade and Trumbull. Mighty Marmalade has been racing in terrific fashion, knocking on the door with 3 very close-up 2nds whilst Trumbull is first-up having trialled impressively recently at Newcastle.